I have never had the chance to thank him for the healing and the gift of new eyes. As a patient myself I knew how strengthening and life transforming such genuine meetings can be. How they open new possibilities. Perhaps this poem is the message that education needs to deliver to every student. It is a message for all of us as well. Excerpted from Rachel Naomi Remen's blog. ​Her groundbreaking curriculumn, the Healer’s Art is now taught yearly in more than half of American medical schools and in medical schools in seven countries abroad. Seed questions for reflection: What do you understand by the "field beyond right and wrong?" Can you share a personal story of a time when you were able to enter the field beyond right and wrong? What practice helps you develop the new eyes to see beyond right and wrong? When I can truly step into that place, especially in intimate relationship. where I can let go and just hold space for my wife, regardless of what's going on with her; essentially, to be that strong rock of support that I know she needs at that time; that to me is being in that field of love, beyond right and wrong. Kabir said"Hum Sab Mai,Sab Hai Hum Mai" When the life force is one,there is no question of any right/wrong. Galib said" Duniya Me Hun,Magar Duniya Ka Talabdar Nahi Hun. Har Chand Hosho Me Hun, Magar Hoshiyar Nahi Hun"
In this condition where is the scope for any judgement on wrong/right. I believe, as I learned from a mentor John Warkentin, that the most significant contact between two people is unconscious to unconscious, soul to soul. My words and actions are feeble compared to my real inner presence that affects the other and is affected by the inner presence of the other. 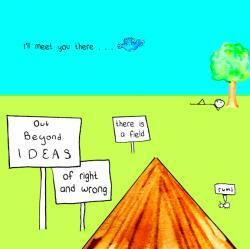 The field beyond right and wrong is the field of my unconscious, beyond intention, purpose, goals. It is the field of right action of the eight fold path, wherein I do my truth impeccably, leaving the outcome to God, hoping for the best. The response is a surprise -- sometimes I get no overt response, sometimes I get a negative response, and sometimes I get a positive response of having touched someone in a deep way. Being in the field beyond right and wrong is satisfying in itself -- a positive response, such as receiving a thank you, is a satisfying bonus. What helps me develop new eyes to see beyond right and wrong is reminding myself that my responsibility is to be true to my experience or truth and not try to control outcome -- learning that opens my eyes. Rumi's poem says it all. Yes . There is a place beyond right and wrong, a place beyond the legal, rational, social and moral right and wrong. And that place is the place where there is no yours or mine zone. As the Buddha says: Gone, gone, gone beyond the gone and even beyond the beyond. What an awakening! what a bliss! Our two worldly eyes are colored by the non-unifying perspective. We live in the dualistic physical, mental, emotional social and even religious world. As law- abiding citizens of this world, understandably, we need to comply with the laws to maintain social order.However, when we love someone from our heart and in our heart, the outbound rules and regulations disappear and we breathe the same breath. The other is no more the other. The other is me and me is the other. There is seamless oneness. This is not an ideal utterance or wishful thinking. I have experienced such Divine oneness in deep meditative state, in relationships with people close to me or remote from me. I feel it like being in the clear blue sky. It is like being touched by a cool breeze of air, like holding a baby in our hands, or someone offering a glass of water to a thirsty traveler. I have experienced such precious moments. We are blessed to have such Divine experiences in this world while we are alive. May we know how to to create such a sanctuary and live in the field beyond the right and wrong!